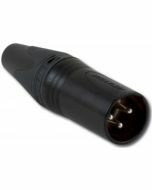 Industry-standard XLR connector for certain lighting equipment that requires an external power supply. Available in both Inline (cable) and Panel-mount (flush) styles. Solder cups for wire connection.